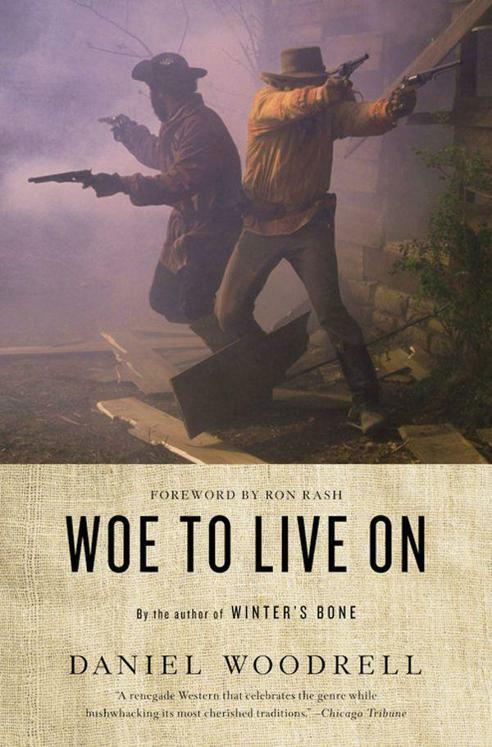 READ Woe to Live On: A Novel FREE online full book. To all my family, here and now, long gone or still dreamed, who do, did, or will take stands on every which side of That Old Mountain, with love and gratitude. The author wishes to thank the Copernicus Foundation and the Iowa Writers’ Workshop for the assistance provided by a James A. Michener Fellowship. First off, let me say that most American novelists would not have attempted to write this book. They wouldn’t have the courage to tell a story where racial epithets are common and, even worse, a major character is a black man who fights for the Confederacy. It would not matter that the offensive language was true to the time period and place or that the black soldier was based on a member of Quantrill’s Raiders, a man who can be seen in a 1904 reunion photograph. These are parts of history a good many people would prefer remain unacknowledged, and those people will resent an author for bringing such matters to light. is to render the world as it was, not as we wish it to have been. provides an answer that is neither nihilistic nor sentimental—and is sometimes contradicted in the novel itself—but nevertheless is one that I find satisfying and true to the complexity of the human heart. is one of his finest achievements. The reissue of this novel is cause for celebration. Playing war is played out! the hillocks and vales of Missouri, hiding in uniforms of Yankee blue. Our scouts were out left flank and right flank, while Pitt Mackeson and me formed the point. The night had been long and arduous, the horses were lathered to the withers and dust was caking mud to our jackets. We had been aided through the night by busthead whiskey and our breaths blasphemed the scent of early morning spring. Blossoms had begun a cautious bloom on dogwood trees, and grass broke beneath hooves to impart rich, green odor. The Sni-A-Bar flowed to the west, a slight creek more than a river, but a comfort to tongues dried gamy and horses hard rode. We were making our way down the slope to it, through a copse of hickory trees full of housewife squirrels gossiping at our passing, when we saw a wagon halted near the stream. There was a man holding a hat for his hitched team to drink from, and a woman, a girl in red flannel and a boy who was splashing about at the water’s edge, raising mud. The man’s voice boomed to scold the boy for this, as he had yet to drink. The language of his bark put him in peril. “Dutchman,” Mackeson said, then spit. “Goddamn lop-eared St. Louis Dutchman.” Mackeson was American and had no use for foreigners, and only a little for me. He had eyes that were not set level in his hatchet face, so that he saw you top and bottom in one glance. I watched him close when crowds of guns were banging, and kept him to my front. “Let us bring Black John up,” I said. I turned in my saddle and raised my right hand above me, waved a circle with it, then pointed ahead. The main group was trailing us by some distance, so we had to pause while Black John brought the boys up. When they were abreast of us the files parted and Black John took one column of blue to the right, and Coleman Younger took the other to the left. This movement caused some noise. The Dutchman was made alert by the rumble of hooves but had no chance to escape us. We tightened our circle about the wagon, made certain the family was alone, then dismounted. The family crusted around the Dutchman, not in fear, but to introduce themselves. Our uniforms were a relief to them, for they did not look closely at our mismatched trousers and our hats that had rebel locks trailing below them. This was a common mistake and we took pleasure in prompting it. Most of the boys couldn’t be excited by a single man, so they led their mounts to the stream, renewed their friendship with whiskey and generally tomfooled about near the water. Black John Ambrose, Mackeson, me and a few others confronted the Dutchman. He offered his hand to Black John, whose stiff height, bristly black curls and hard-set face made his leadership plain. “Wilhelm Schnellenberger,” the Dutchman said. Black John did not extend his own hand, but spit, as Americans are wont to do when confident of their might. I spit, then pawed the glob with my boot. “Are you certain you are not at all secesh?” Black John asked once more, his lips split in a manner that might be a grin. The woman, the girl and the boy nodded in agreement, the boy beginning to study our uniforms. He was about four years younger than me and looked to be a smart sprout despite his snubbed nose and loose jaw. I kept a watch on him. Black John pursed his lips and poised to speak, like a preacher caught breathless between the good news and the bad. Some of the fellows were in the shallows kicking a stick to and fro, trying to keep it in the air, whiskey to the winner. It was a poetry moment: water, whiskey, no danger, a friendly sun in the sky, larks and laughter. enough anyway, for when she flung her arms about him wailing, he sunk to his knees. His head lolled back on his neck and his face went white. He began mumbling about his god, and I was thinking how his god must’ve missed the boat from Hamburg, for he was not near handy enough to be of use in this land. “He is praying to Abe Lincoln,” I answered. A rope was needed. Coleman Younger had a good one but would not lend it as it was new, so we used mine. Mackeson formed it into a noose with seven coils rather than thirteen, for he had no inclination to bring bad luck onto himself. Thirteen is proper, though, and some things ought to be done right. I raised this issue. The rope burned between my fingers as I worked to make the Dutchman’s end a proper one. The situation had sunk in on the family and they had become dull. The Dutchman saw something in me and began to speak. He leaned toward me and wiggle-waggled in that alien tongue of ours. I acted put upon by having thus to illustrate my skill in oddball dialects, lest I be watched for signs of pride in the use of my parents’ language.